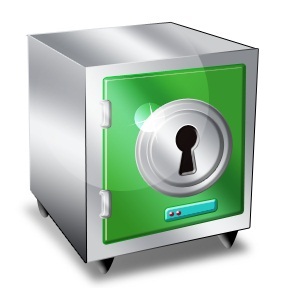 The Tenant File allows you to easily backup your valuable data and even reminds you at intervals. Just choose how often you want to be reminded and the Tenant File will let you know when it is time. It is very important that you back up your data on a regular basis. This example shows that a backup folder has been created with weekly sub-folders. You can set up any folders that you wish to back up to, but be aware that any backup will overwrite the previous data unless it is in a separate folder. We also recommend that you make 'off site' backups of your data in case your computer is compromised. 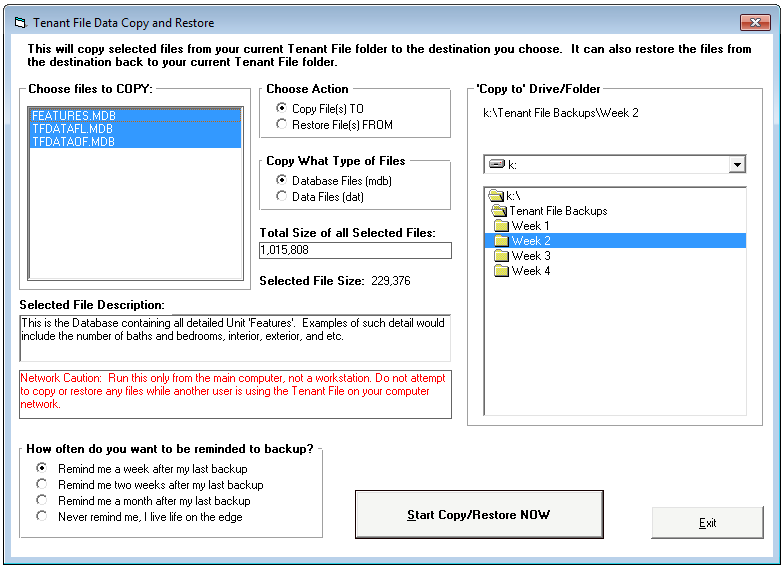 Backing up is as easy as clicking on the 'destination' ('Copy to' Drive/Folder on the right side of the screen) and choosing 'Start Copy/Restore Now'. The main database file (over 90% of your data) is already selected for you. This file is named TFDATAFL.MDB, and is definitely the file to backup often. However, you can choose to back up other files, such as the Inactive Tenant File (TFDATAOF.MDB), and the Features File (FEATURES.MDB). Also, you should sometimes back up your 'DAT' files, which are files that hold your settings, such as your check format, late fee charge settings, and other preferences. On the right side of your screen, you will choose 'where' to back up to. You MUST choose a different folder than the initial one displayed, since that is the folder you are currently using. You can back up your files to any folder or external drive with a drive letter. The Tenant File can remind you when it is time to back up your data. Just select one of the choices in the bottom left corner. Whenever you exit the program, it will check to see if it is time for another backup and take you to the correct screen to complete the backup. Instead of using the Tenant File Backup Utility, you may need to use the built-in Windows method of highlighting the file(s) you wish to copy from the Tenant File folder (normally C:\Tenant File\TF4WIN), then right-click and select 'Send To'. Choose your CD/DVD drive letter and start the copy.